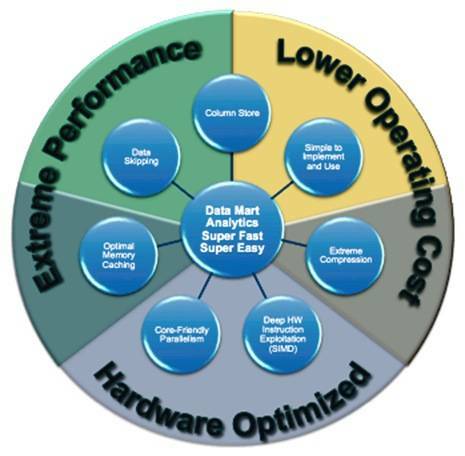 IBM Research has come up with a new package it calls BLU Acceleration, intended to speed up (big) data analysis and reporting of data held in DB2 and Informix databases, amongst others. BLU Acceleration extends the capabilities of traditional in-memory systems - which allow data to be loaded into Random Access Memory instead of hard disks for faster performance - by providing in-memory performance even when data sets exceed the size of the memory. They don't explain how they managed this miracle. "Using DB2 with BLU Acceleration … we're performing tasks more quickly than ever before, for example, one of the queries improved over 100-fold, and our storage consumption went down by about 10 times." IBM should also add BLU Acceleration techniques to its Cognos BI (pdf, slide 21) product.